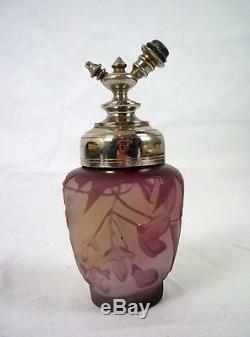 A beautiful Art Nouveau cameo glass scent bottle by Émile Gallé. The bottle has been carved in a sweet peas design with a deep purple surface giving way to a frosted clear glass beneath. The frosting gives a rich velvety texture which compliments the gloss of the surface decoration adding a sense of depth to the piece. The detailing to the flowers is just exquisite. The bottle is signed "Galle" to the front. Emile Galle - French, 1846 to 1904, an artist, botanist and furniture designer, Gallé was the most famous of the Nancy Art Nouveau Glass-makers. He is best known for his Cameo Glass, which is made by layering coloured glass, using acid to remove part of the layers and on the better pieces adding wheel carved detail. The bottle stands at 5 inches (12.5cm) with the diameter of 2.25 inches (5.5cm). The piece is in beautiful condition with two tiny chips, one just underneath the signature and the other one to the middle of the flowers. The perfume sprayer is missing its bulb so has not been tested. For further details and condition see pictures below... The item "Emile Gallé (1846-1904) Cameo Glass Scent Bottle Decorated with Sweet Peas" is in sale since Friday, March 29, 2013. This item is in the category "Pottery, Porcelain & Glass\Glass\Art Glass\French\Emile Galle". The seller is "theantiquesstorehouse" and is located in Portsmouth, Hampshire. This item can be shipped worldwide.